The New Church of Montgomery is 200+ Years Old. In 2011, The New Church of Montgomery, formerly known as the First New Jerusalem Society of Cincinnati, celebrated 200 years of faith and service in the greater Cincinnati area. The celebration was marked by hosting the National Swedenborgian Church convention and art exhibits at the Taft Museum of Art and the DAAP. 1808 Adam Hurdus holds meetings in his home on Front Street, between Vine and Race Streets. Mr. Hurdus builds a parlor organ, the first organ built in Cincinnati, to enhance the services. 1819 The first church building is erected on the north side of Centre Street (later Longworth) Street, between Race and Elm. It is a plain frame structure, painted white, and seating 350 persons. 1834 A new church building designed by Charles Sonntag is built on the site of the first church. 1860 A building lot is purchased on the southeast corner of Mound and Eighth Streets. 1861 Civil War breaks out, and building plans are postponed. 1880 Women get full voting rights. A marble bust of Swedenborg by sculptor Preston Powers is presented to the church. It was on loan to the Cincinnati Art Museum for several years, and to the Chicago Society during the Chicago World’s Fair. 1903 A new church is built at Oak Street and Winslow Avenue, in Walnut Hills. It is named the New Jerusalem Church. 1968 Oak and Winslow church taken by the city for freeway construction. A new church is built on East Kemper Road, between Weller Road and West Loveland Avenue, in Symmes Township (now the City of Montgomery). 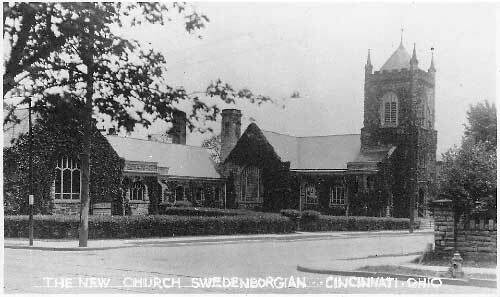 The church is named Kemper Road Swedenborgian Church. 1970 An outdoor chapel is created on the church grounds for weddings and special events. 1994 Rev. John Billings elected Minister. 2010 Church location moved to the Strawser Funeral Home Chapel. 2015 Church services are offered at the Glendale New Church thanks to a space sharing agreement.